By the same token, if the Rajoy government manages to stop October 1, it will be a setback not only for Catalan aspirations to sovereignty but also for all forces in Spain fighting for democratic rights and against austerity. The partial weakening of the “1978 regime” represented by the rise of anti-austerity party Podemos and its allies would be contained: the “constitutionalist” parties—the PP, the Spanish Socialist Workers Party (PSOE) and the hipster neoliberal outfit Citizens—would be strengthened. Understanding of the stakes of the fight is increasingly reaching across the whole Spanish state, with left forces like Podemos and the older United Left, which had originally rejected October 1 as “not the referendum Catalonia needs”, now allying with pro-independence forces in the face of a legal and police offensive that amounts to a state of emergency in all but name. •	Open proceedings against the 712 Catalan mayors (out of 948) who have indicated that their councils will make premises available—as per normal—for the referendum. The mayors are to be summoned to regional prosecutor’s offices, where they will face charges of disobeying a lawful instruction, perversion of the course of justice and misuse of public funds (which carries a jail sentence). The Catalan police have been ordered to arrest any mayor who fails his or her appointment with the prosecutor. Symptomatic of the rising concern the Catalan rebellion is causing in the establishment was the September 12 decision of a Madrid judge to ban a meeting on the Catalan right to decide from taking place on Madrid Council premises: the grounds were that “the general interests of the citizens precludes the realisation of public events in favour of an illegal referendum”. The organisers of the meeting, the platform Madrid for the Right to Decide, then rescheduled the meeting to another location. When it was finally held on September 16, the crowd overflowed the theatre and filled the nearby street. At the time of writing, over 60,000 people potentially face charges for associating themselves with the “illegal” referendum and the rumours are of even more drastic action to come. The PP is supposedly moving towards establishing the legal and political grounds for suspending the Catalan government under article 155 of the Spanish Constitution; 4000 extra National Police are ready to be deployed; the Civil Guard is bringing extra agents into Catalonia—such is the daily dose of psychological warfare to which Catalans are being exposed. The blatant goal of the central government campaign has been to create a climate of fear and panic: the October 1 referendum is a political Chernobyl—if you even touch it you won’t only go to jail, you´ll lose all your assets--like former Catalan premier Artur Mas and three of his ministers, who stand to lose five million euros for allowing a September 9, 2014 “participatory process” (9N) to go ahead in the face of a court ban (over 2.3 million of Catalonia’s 5.5 million voters took part). Central government ministers have personally weighed into this campaign. On September 12, finance minister Cristobal Montoro said that “nobody’s going to use a euro of public money against the law: it didn’t happen on November 9, and it won’t happen on October 1, unless someone wants to put their assets at risk.” On September 13, Rajoy announced: “I say to everyone who understands that the government has to carry out its obligation, that we’re going to do that, that they needn’t worry. If anyone is asked to staff a voting centre, don’t go because there can’t be a referendum and it would be an absolutely illegal act.” With this statement Rajoy unwittingly betrayed his government’s double approach: to stop the referendum by any and every means that don’t entail an intolerable political cost (like sending in the army) and, if that’s finally not possible, to at least drive participation in the referendum to as low a point as possible. At the core of the PP approach is the big lie that the Spanish government has no choice but to have the law obeyed because a Scottish-style negotiated referendum was always impossible under the Spanish constitution. However, as many Spanish jurists have pointed out, the Constitution provides mechanisms for consultations of a part of the population of the Spanish state—the PP chose not to have one in the Catalan case because it has always seen greater political gain in cultivating anti-Catalanism in the rest of Spain. The majority also had to shun the advice of the parliamentary speakership panel’s two legal advisers—who pointed out the bill’s unconstitutionality in terms of Spanish law—and to refuse to allow parliament to seek an opinion from the Catalan Council of Statutory Guarantees, which would also have been certain to point out that incompatibility. CQSEP MP Joan Coscubiela described this approach as “unprecedentedly anti-democratic”. Colau’s position reflected a shift in Catalonia’s non-independence left towards participating in October 1, even while still regarding it as “not the referendum Catalonia needs” but mobilisation against the Rajoy government and for a Catalan right to decide. This is because a considerable part of its support—mainly but not only working people from other parts of Spain who have immigrated to Catalonia—do not support a unilateral referendum in which the independence case is likely to win. In the world of the “commons”—the catch-all term for Barcelona en Comú (running Barcelona Council), En Comú Podem (largest Catalan force in the Spanish parliament) and Catalunya en Comú (grouping together Barcelona en Comú and the “old left” forces Initiative for Catalonia-Greens, United and Alternative Left and the green party Equo)—the October 1 referendum had intensified differences over how to relate to a unilateral consultation. However, in the atmosphere of increasing aggression from the Rajoy government a shift towards greater support for October 1 showed in the results of Catalunya en Comú’s membership ballot on whether to participate. The result was 59.39% for to 41.61% against, with 44% of the membership taking part. According to its coordinator Xavier Domènech, Catalunya en Comú will "stage events denouncing the repression and affirming the rights of the Catalans … If, finally, there are ballot boxes, we'll be going to vote." 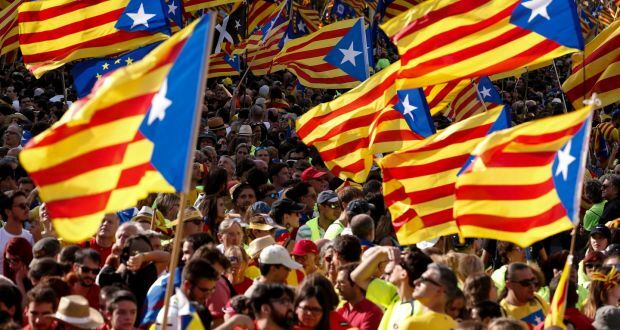 This was a move away from an initial orientation that focussed more on demanding guarantees from the Catalan government than on how Catalunya en Comú might be able to intervene most fruitfully in the referendum process. It also represented a defeat for those forces in the party that had called for a boycott of October 1, as organised around the manifesto “Don’t Participate or Call for Participation in the October 1 Referendum”. The shift also came with the effective dropping of their call by Pablo Iglesias and Alberto Garzón, leaders at the level of the Spanish state of Podemos and the United Left, for the commons not to participate. Nevertheless, despite the Catalunya en Comú membership ballot result certain mayors within the universe of the commons will still not be making their councils premises available for the referendum, the main example being the Initiative For Catalonia mayor of the greater Barcelona industrial town El Prat de Llobregat. In other councils where councilors from the commons are part of the government—especially in partnership with ERC—they have already voted to make premises available on October 1. The party has started an active boycott campaign, launching a manifesto called “On the illegal ‘referendum’ of October 1”. There are signs that this may be beginning to have some effect: all polls previous to September 17 showed around 50% of PSC supporters prepared to vote in the referendum. This figure has fallen in the latest Opinòmetre poll to 35%. However, even as it tries to wreck October 1 and supports all legal activity to stop it, the PSC has to try to appear as not simply the running dog of the PP. A sign that it doesn not want to cut all ties with forces supporting the referendum was a September 10 statement by PSOE federal secretary Pedro Sánchez to the effect that, even if Barcelona Council provided voting centres for the referendum, he did not think the PSC should break its governing alliance with Ada Colau’s party (Barcelona en Comú). The deciding factors will be: whether the Puigdemont government is organised enough to ward off Madrid’s sustained attack on the logistics of October 1; whether the mass of Catalan supporters of independence—and of basic democratic rights--are strong enough to make the Rajoy government pay as high a political price as possible for each new act of aggression; and whether, in the case that the referendum goes ahead, the enormous media campaign to denigrate it as a “fraud” fails to reduce participation. Within Catalonia, the Civil Guard’s confiscation of posters is being answered with the reproduction on home printers of posters downloaded from improvised web sites and then pasted up by teams of volunteers from the Catalan mass organisations. The September 16-17 weekend meetings on the referendum went ahead without police interference and were bigger than all expectations (and the halls in which they were supposed to fit). On September 17, 30,000 marched in Bilbao (in the Basque Country) in support of Catalonia’s referendum. The campaign for October 1 is increasingly taking the form of a peaceful insurrection for democracy against the authoritarian Spanish state—all democrats will be doing what they can to help it prevail.